DO you have a tire light on? The wrong tire pressure can be very risky and cause your vehicle to become unstable in many circumstances. It can affect your vehicles handling, braking, fuel economy, the life of your tires, and even the comfort of your ride! Tire pressure is measured in pounds per square inch (psi) is different for each vehicle depending on the tire used, vehicle manufacture, and weight load. Why Do Tire Pressures Change? Tire pressure changes with many factors. Most commonly would be the temperature outside, and damage to the tire from items in the road such as nails. It is normal for tires to lose 1-2 psi per month due to regular wear and tear. What Can Happen When Tire Pressures Change? A tire pressure that’s too high will result in less tire touching the ground. This makes a harder ride and compromised traction. Effecting the ability to turn and stop quickly. A tire over inflated by as much as 5 psi can damage more easily when run over potholes or road debris. 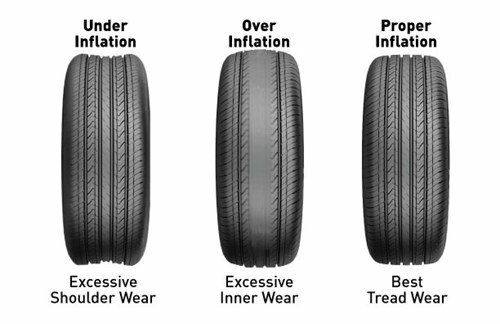 Over time, over inflated tires lead to unnecessary tire tread wear, shortening the overall life of your tires. First, identify the recommended tire pressure for your vehicle. You will find this information inside of the driver door on a sticker. If you cant find it there check in your vehicles owners manual. If you do not have a tire pressure light get in the routine of checking your tires on a schedule. This way you wont forget about them. Use a high quality tire pressure gauge to be accurate and check pressure when the tires are at air temperature and haven’t been driven more than a few miles. Remember to check all of your tires, don’t assume the last one is good just because the first ones are at the correct pressure. Check your spare tire, too, to ensure it’s ready to be used in an emergency. If your not comfortable doing this on your own, Feel free to bring it by to us any time for a free check up! Checking your tire psi regularly can help keep your tires in optimal condition for as long as possible, along with a good alignment and good driving habits. It might just save you a little cash down the road. Great service for a great price. Steve is a great guy who never tries to push or sell you on unnecessary work. He is straight-forward, honest, and great to work with. So happy I was able to have them work on my brakes while I was in Radford for a couple days. I live in Northern, Va but was in town visiting a friend. The place I took my car to before gave me an outrageous price quote that I knew I couldn't trust. Luckily the car doctors did the same fix for a much, much more reasonable price. I will gladly bring my car back here if I'm ever in town again! So happy I was able to support a honest, small business. I recently moved from Vermont to Washington D.C. I have a 2013 Kia Optima with approximately 113,000 miles, and I let my car go FAR too long before getting service. I didn't want to go to the dealer and thought I would eventually get back to my 20-year-trusted mechanic back home. Well, when the brakes started grinding I turned to Yelp and found The Car Doctor. The experience was wonderful from the moment I walked into the moment they delivered my car back in perfect working order. The price seemed fair, and everything was explained in detail. The was no pressure, and I was given clear options as to what had to happen right away and what could wait. Having a mechanic, you can trust to both fix your car and not make you feel like an idiot is essential. I've finally found mine here in the DMV! I love when you can find a mechanic that's as trustworthy as your own father! They're an independent repair shop that treats you like a client that they're happy to have. I'll never take my car anywhere else! I'm so glad I found this place. My husband and I both take our car here to be serviced. They do excellent work, are quick, easy to get an appointment with, and most importantly - they are HONEST! They will tell you if you can wait on a service, or if something is unnecessary, and they won't charge you for things that you don't need. Everyone that I've dealt with there is very friendly, as well. Like other reviewers we went to the car doctor because of all the positive reviews! We took our son's Nissan in for a full service, it has 100k miles and was sluggish to say the least. We couldn't be happier, the service manager Steve called and went through their findings in detail. It's now driving like a car with half the miles and is smooth and quiet. Thanks for a job well done, we'll be back. The Car Doctor has serviced my Honda for years and, without exception, they have done excellent work at a reasonable price. The real benefit of finding a trustworthy mechanic/shop is when they give you options and/or actually turn down business because you don't need the repair. These guys seem like they're interested in establishing long term relationships with their customers based on quality work and honest assessments of a car's condition. They merit five-stars in my book for honesty, integrity, and quality work. This business cares about their customers and that is evident not only in the quality of the customer service, but also in the quality of car care. 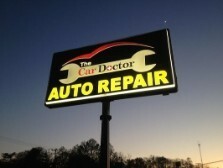 This place is well worth the drive from Washington DC for great, reliable, well-priced car repairs. They had a bay reserved for me when I got there. My car was being serviced inside of 5 minutes. They had just had breakfast delivered and asked me if I wanted some pancakes. :-) In checking the car, they found a locking lug nut missing. They called around to area businesses asking if they had a spare one they could sell me as opposed to a set of 4, which I didn't need. They were done inside of 45 minutes. The mechanic reviewed a couple things with me that could wait until next time and there was no pressure applied at all to try and sell me things I didn't need. These are some of the nicest people you will ever meet. Disclaimer: *No interest if paid in full within 6 months* $299 Minimum purchase required. Interest will be charged to your account from the purchase date if the purchase balance is not paid in full within 6 months or if you make a late payment. *Minimum monthly payments required. Applicable to purchase make January 1, 2014 through December 31, 2014. APR: 22.8%. Minimum Finance Charge: $1.00. CFNA reserves the right to change APR, fees and other terms unilaterally.